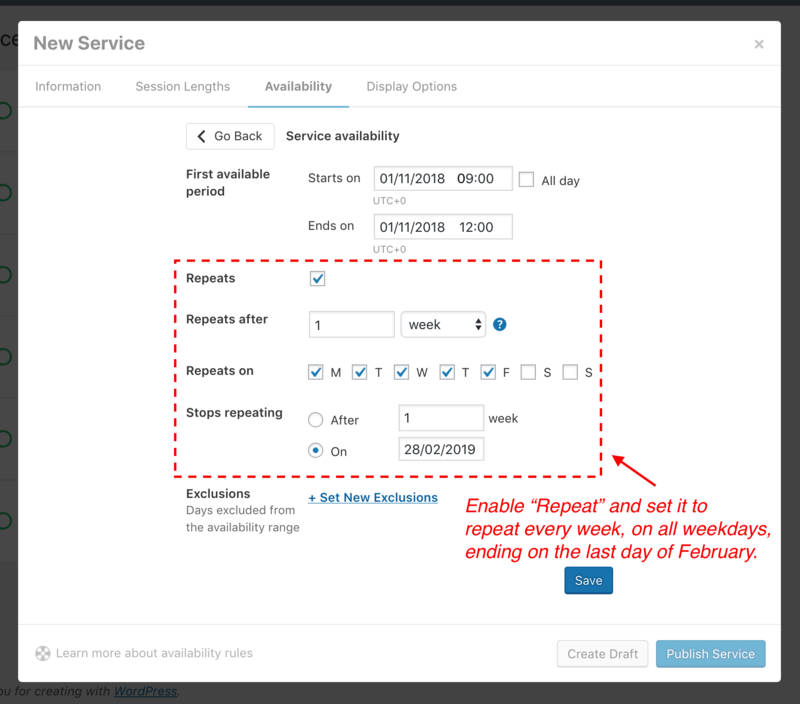 The Availability tab when setting up a new service uses an approach we thought up that gives you as much flexibility as possible when setting up the days and times that your services are available. 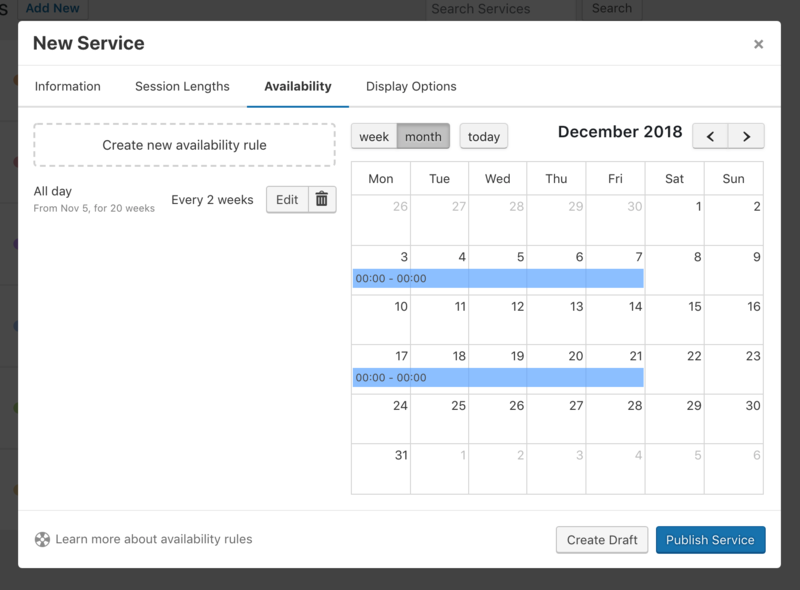 NOTE: Appointments that are booked for each service are not shown in the availability calendar preview for each service. 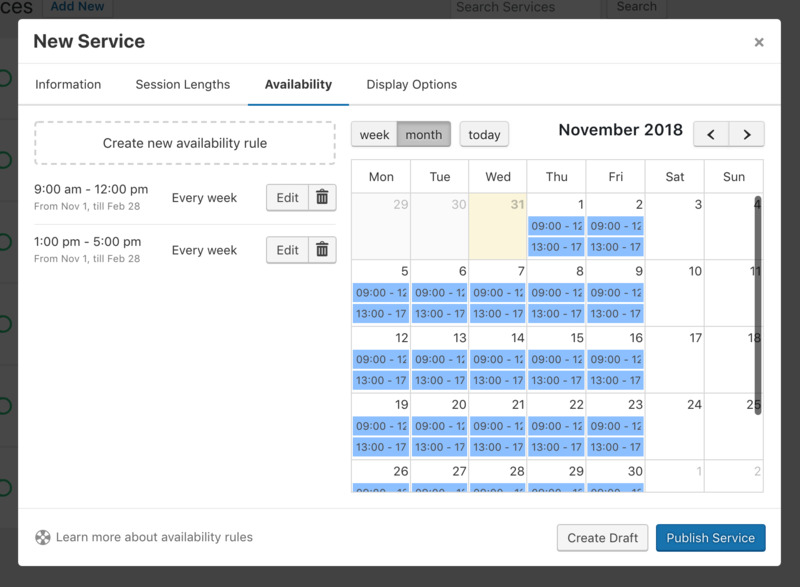 The calendar will show what the availability for the service will look like, but it will not block out any dates or that are booked. To see a calendar view of your bookings, please go to the Bookings page . 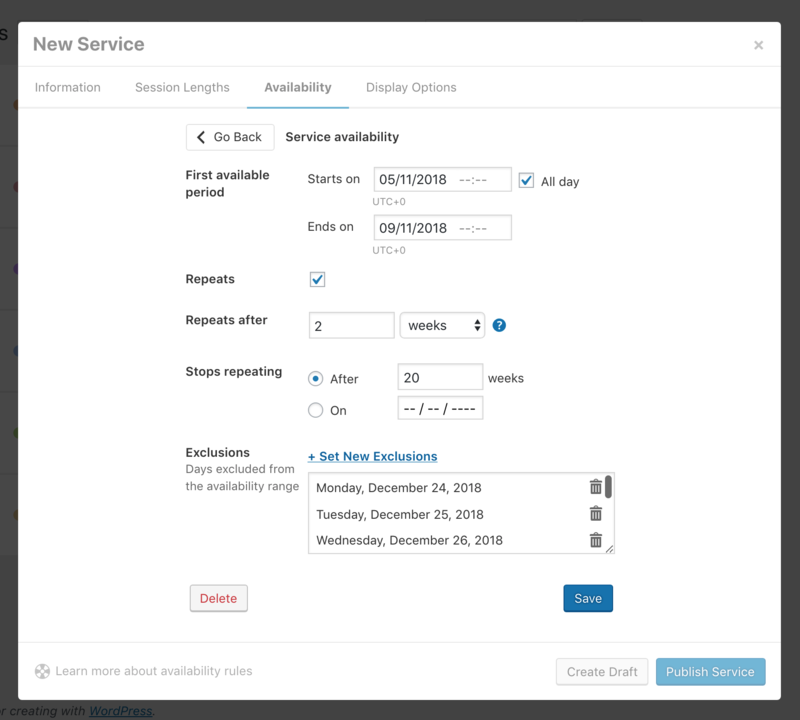 Once you have set up your service's information and session lengths, it's time to move on to the availability rules. From here we will set up the available dates and times for a service. It's best to explain how this works with a couple of examples. 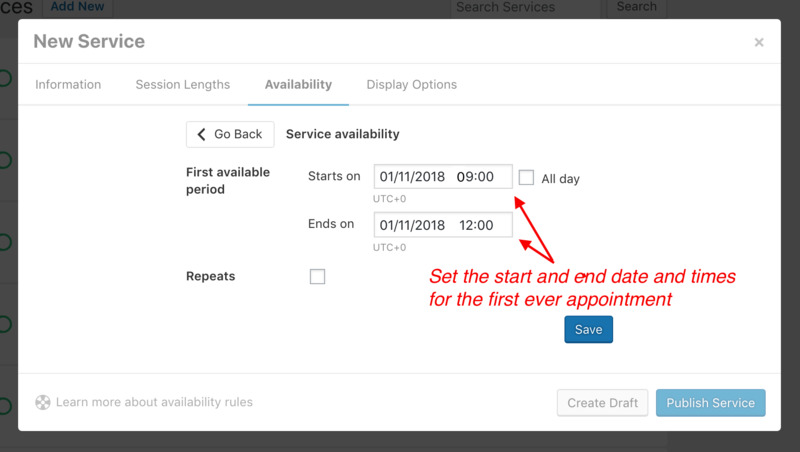 First off, click on the button to Create new availability rule, or you can even click on a day from the calendar preview on the right to start a new rule from that date. In this example, our service is available weekly, from Monday to Friday, between 9am and 12pm, and then again between 1pm and 5pm. It will run from November 1st, 2018 through to February 28, 2019. It will not be available over the Christmas and New Year periods. To start off, set the first available period. This is the first day that this service will be available. In our example below, it's the 1st of November. The start time is 9am and the end time will be on the same day at 12pm. Remember, this is still the first period we are setting up. We will set up the afternoon times soon. Since the service is available on the same days and at the same time every week, we can use the Repeats option. Choose the week option to select the days of the week. In our case, it's Monday, Tuesday, Wednesday, Thursday and Friday - the weekdays. It ends on 28th February, 2019, as we said above. Exclusions are the days when the service will not be available. We said that this will be the case over Christmas and New Year for this service. So, select the dates from the calendar (they will be listed in the list below, and you can remove dates at any time by clicking on the trash icon or on the blue date in the calendar again). You're all set! Hit the Save button at the button and you'll be taken back to the Availability tab. 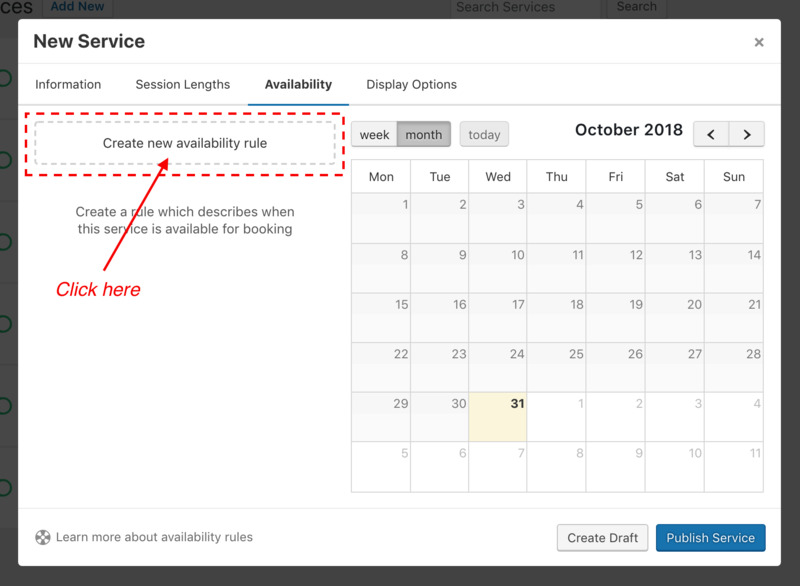 Here, the rule will appear in the list on the left and the calendar on the right will show a preview of exactly what days your clients will see as available in the booking form. You will now need to repeat the above steps for the times from 1pm till 5pm. Once you've set it up, the list and the calendar preview will be updated to show both rules, as seen below. 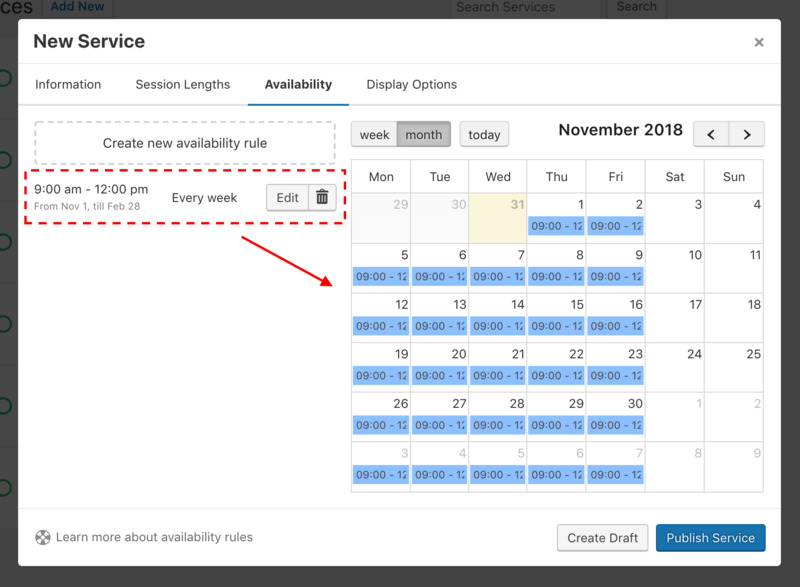 NOTE: Every availability rule can be edited from the Edit button beside it. It can also be deleted permanently by clicking on the trash can icon beside the Edit button. 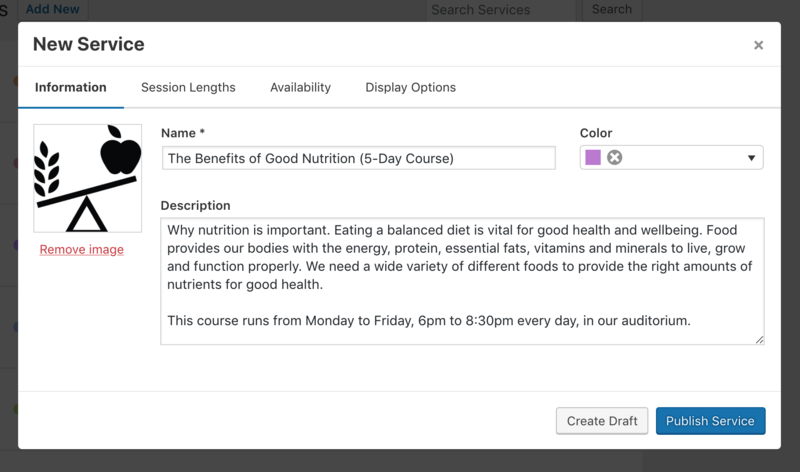 In this example, our course is available every two weeks (one week off in between each course). The course itself runs from Monday to Friday, between 6pm and 8:30pm. Now, since the client is booking a full 5 days at a time, we only need to show the times in the description, as we'll see below. It will not be available over the Christmas and New Year periods. To start off, set the first available period. This is the first week (Monday to Friday) that this course will be available. In our example below, it's the 5th of November. Notice how we can now tick the All Day checkbox besides the start date (which automatically removes the need for specific times of the day). the course is available on the same days every 2 weeks, we can use the Repeats option again. Choose the week option, but this time notice how we don't have days of the week appearing. This is because the service runs through full days. 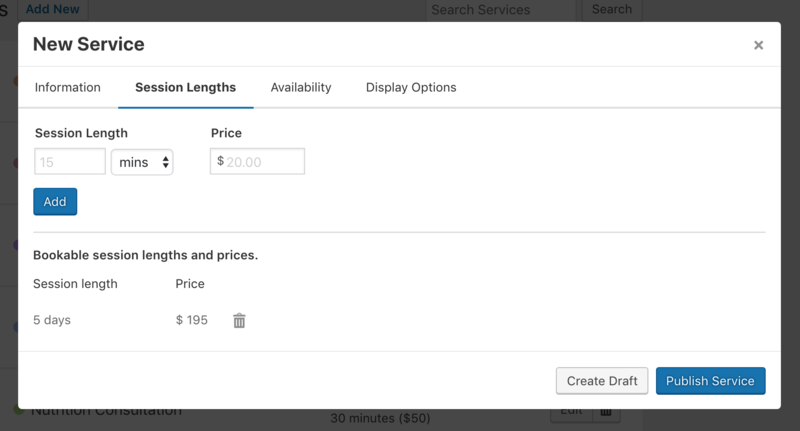 Set the value to 2 since it's available every 2 weeks, and set how long it should go on for. In our case, it's for 20 consecutive weeks (so 10 courses will be provided in total). 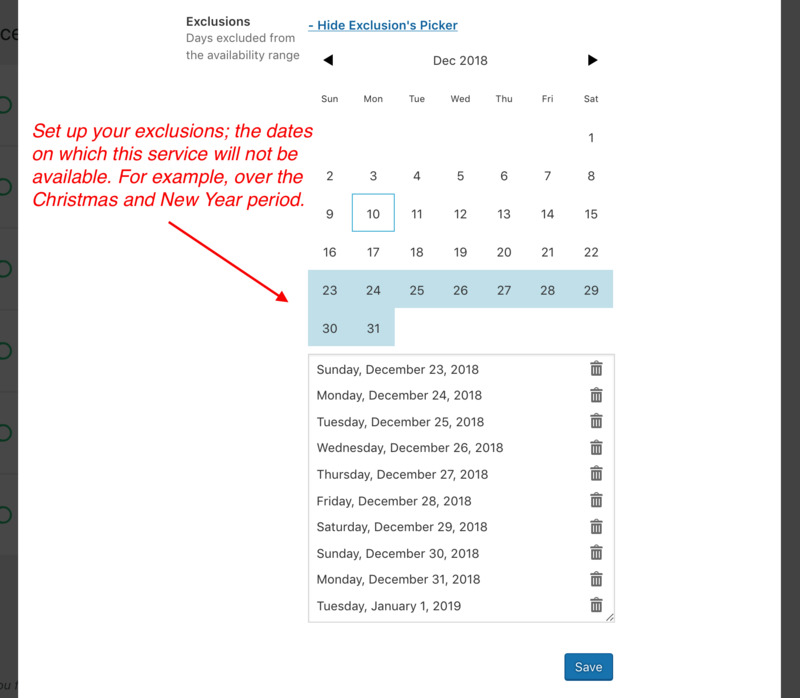 Once again, Exclusions can be set for the Christmas and New Year period to make sure the course is never available on those dates, even if it coincides with the schedule of "every 2 weeks". Repeating every x number of days will repeat the start and end times you set above every x number of days that you set. Setting it to 1 would repeat every single day. Setting it to 2 would skip a day between each available day. For example, 3rd June, 5th June, 7th June, and so on. Setting it to 3 would skip two days between each available day. For example, 3rd June, 6th June, 9th June, and so on. Repeating every x number of weeks will repeat the start and end times you set above every x number of weeks that you set. If the length of time between the Start and End times you set is within the same 24 hours, you are presented with a further option to choose the days of the week that this availability repeats itself on. For example, if you set Friday 9th to be available from 9am until 5pm, and set it to repeat every 1 week, you can then set it to repeat on specific days of the week, such as Fridays, Saturdays and Sundays. If the length of time between the Start and End times you set is not within the same 24 hours, you can only set every how many weeks this repetition should happen. Repeating every x number of months will repeat the start and end times you set above every x number of months that you set. With the months option you have two subsequent options. The first is to repeat on the day of the month (value) you selected above, for example, the 9th of every month. If you select a day of the month that is not available every month, for example, the 31st, the months without that date available would be skipped. The second is to repeat on the day of the week (in that month) you selected above, for example, the second Friday of every month. Once again, if you select a day of the month that is not available every month, for example, the fifth Monday, the months without that date available would be skipped. Repeating every x number of years will repeat the start and end times you set above every x number of years that you set. This option is straightforward. It only repeats itself on that specific day of the year.